I am currently working with others on the Cable Street 75 committee organising a march and rally to commemorate the 75th anniversary of the Battle of Cable Street. It is just one part of this year’s commemoration. I have put together a listings of the events that I have full details of below. More information for the various events is being added to all the time so please visit the respective websites. 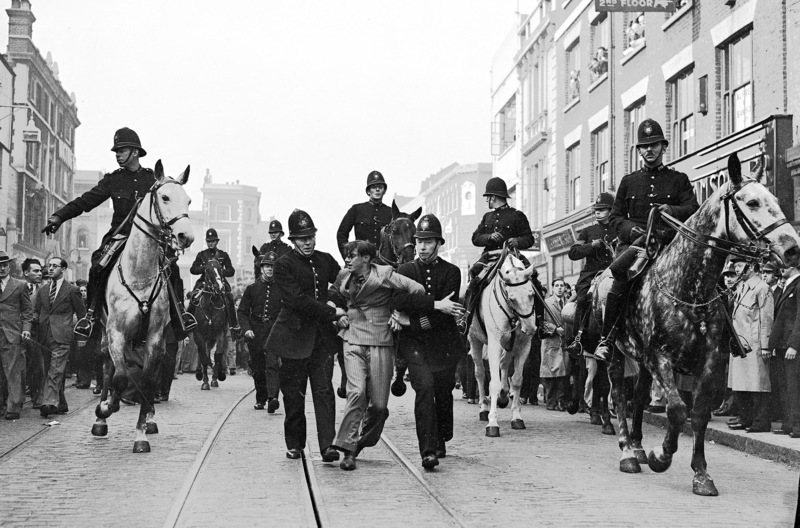 A programme of events and exhibitions to celebrate and commemorate the Battle of Cable Street. 12 noon – 6pm Stalls along Graces Alley by campaigning groups, local organisations and supporters with street theatre and music by La Columna, The Lost Marbles, The Fairly Fresh Fish Co, Klezmania and The Cockney Awkestra. 12 noon – 10pm Protest & Survive Exhibition with photography documenting the Battle, posters from the Spanish Civil War, images recording the past 25 years of protest against racial discrimination by Phil Maxwell and portraits of the diverse communities of the East End today by documentary photographers Kalin Coromina, Ned Dyke-Coomes, Zane Mellupe, Lydia Polzer, Ben Speck and Neil White. Specially commissioned concert by 30 diverse talented young under the leadership of Tony Haynes, director of the Grand Union Orchestra. 3pm Book launch and Reception Five Leaves is publishing five books to celebrate the anniversary. There will be readings and signings followed by a panel discussion. All the books will be on sale directly from the publisher: The Battle of Cable Street by Cable Street Group; October Day by Frank Griffin; Street of Tall People by Alan Gibbons; Battle for the East End by David Rosenberg; Everything Happens in Cable Street by Roger Mills. 4pm rebels in the 1930s – working class writers Panel discussion with Andy Croft author of Red Letter Days, Ken Worpole author of Dockers and Detectives, Mary Joannou author of Ladies, Please Don’t Smash These Windows: Women’s Writing, Feminism and Social Change 1918-1938. Chaired by Ross Bradshaw of Five Leaves Publishing. 5pm Song & Dance With Sandra Kerr, Leon Rosselson and Udichi Shilpi Gosthi. 7pm Sunday Night at Wilton’s Music Hall ‘They Shall Not Pass’. Star spangled evening with poets, singers, choirs, comics and bands including Billy Bragg, Shappi Khorsandi, Mike Rosen, Ninia Benjamin, Raised Voices and The Men They Couldn’t Hang (acoustic). This walk, led by David Rosenberg, tells the story of how the battle against the fascists was won. Suitable for children aged 10+ accompanied by an adult. David Rosenberg is author of Battle for the East End: Jewish responses to fascism in the 1930s. Kops, who grew up in the East End and was 10 at the time, witnessed the events of the Battle of Cable Street as they unfolded. In conversation with publisher Ross Bardshaw (Five Leaves Publications) Kops will read from his short play about the day’s events as well as from his other work. The reading and conversation will be followed by Q&A. This entry was posted in Blog and tagged anti-fascist, Antisemitism, Battle of Cable Street, fascism, Mosley, nazi. Bookmark the permalink.